Upholstery is a part of your property that isn’t always the first thing that comes to mind when you discuss cleaning. But, if it is made from fabric, leather, etc., it will get dirty and stained. 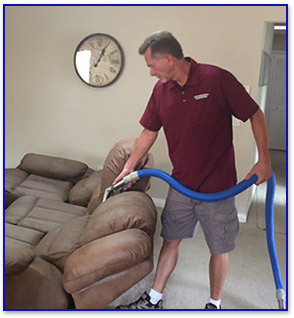 Please consider when you look at the furniture, if it is dirty or stained, call us and we will be glad to discuss with you your options to restore the beauty of your upholstery. Once we have your upholstery clean, we can also apply treatments that will keep it clean longer. Check out our special services for carpet cleaning and rug cleaning. We specialize in restoring and repair of carpeting. Our service is second to none.